The British understanding of a travelling festival is mainly influenced by Reading & Leeds: a line-up of artists performing at each location, before rotating to the other. The festival itself doesn’t travel at all. Dot to Dot, however, does what it says on the tin. The whole line-up performs in one city before moving onto the next, then the next and the next. Not only does this separate it from other festivals, but Dot to Dot is also one of a growing number of multi-venue festivals in the UK – taking inspiration from the success of SXSW in the U.S. 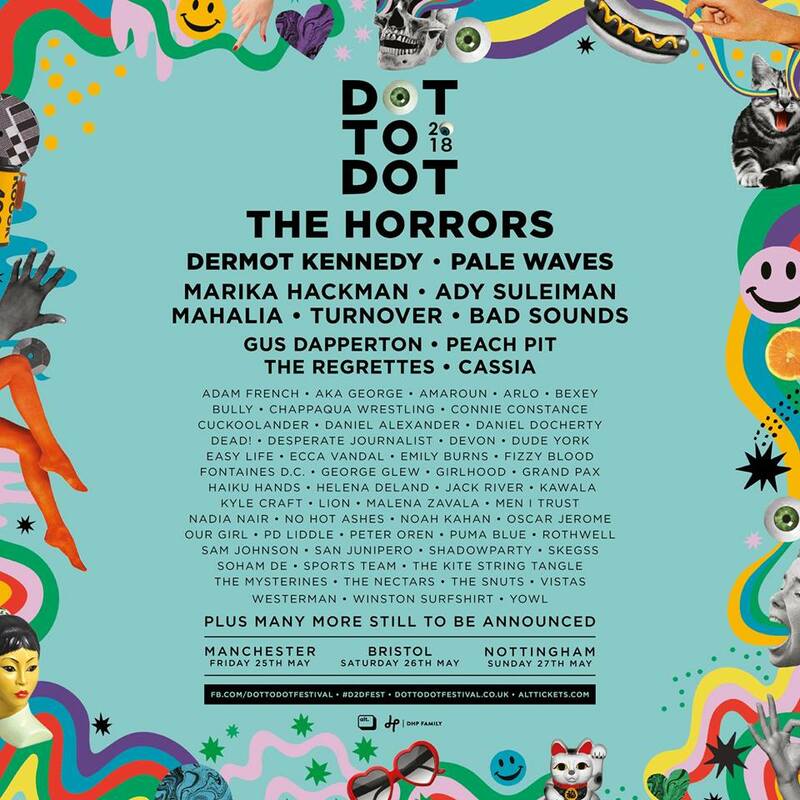 Dot to Dot Festival takes over venues in Manchester, Nottingham and Bristol at the end of this month, aiming to provide a stage for the best new music on offer; and if the acts of previous years are anything to go by then this year’s headliners The Horrors, along with Pale Waves, Marika Hackman and Ady Suleiman could be destined for big things. Artists such as Dua Lipa, Sundara Karma, Bastille, Ed Sheeran and The 1975 have all played the ‘Best Festival for Emerging Talent’ [2017 UK Festival Awards] in the past. Although the line-up is filled with ‘future talent’, it’s also a real array of current talent! Cassia and Pale Waves are experiencing consistent airtime on mainstream radio, SCAN has featured interviews with The Horrors, Marika Hackman and Westerman over the past year or so. One of the most exciting names on the line-up is Ady Suleiman, fresh from the release of his brilliant new album Memories. There’s also a lot of hype around the haunting vocals of Helena Deland – drawing comparison to Lana Del Rey and London Grammar with her powerful and emotional tone. These are the perfect artists for the multi-venue style of festival, none of them are real ‘head-bangers’ or massive dance acts because of the massive focus on the daytime, in contrast to a lot of the major summer festivals. This is so that you can immerse yourself in a relaxing and inclusive atmosphere across the whole range of the venues, dipping into each place and wandering through the city – knowing that everyone around you is also there to enjoy some good music in some of the best venues the UK has to offer. Manchester’s edition boasts the huge and atmospheric Albert Hall, independent venue Band on the Wall and the edgy underground basement venue Soup Kitchen. Perhaps the biggest selling point of this festival is its affordability – even on a student budget – with day tickets available for £13! This seems like a steal as it offers you the entry to all of the participating venues and the opportunity to catch tonnes of bands in a single day for less than most gig tickets cost! So even if you are deep into your exams, join me in a well-earned break and a loaded day of musical indulgence at a festival with a real community atmosphere: and possibly catch a glimpse of some of the best new music the world has to offer! Check out our review of last year’s edition of Dot to Dot, as well as this highlights video! Previous articleWhat to do about Apu?